Max and Juliet’s story is almost here!!! I’m so excited about WHEN A MARQUESS LOVES A WOMAN and can’t wait to share it with each of you! I’ll be sending out a newsletter in the next few days with contest info (and it’s going to be an awesome prize, too). If you’d like to sign up, the link is located at the bottom of each page of my website. I’m feeling incredibly blessed and I hope that each of you have a wonderful surprise today, too. Rafe has every intention of ridding Greyson Park of the conniving Sinclairs once and for all. The last thing he expects is to find the beguiling Hedley—the younger sister of his former fiancée—standing in his way. With drastic measures called for, he plans to marry her off in order to regain control of the estate. The only trouble is, he can’t seem to stop seducing her. Even worse, he can’t help falling in love with her. Stubborn, courageous and full of spit and vinegar, that describes my initial impression of the heroine, Hedley. She has an unusual name which had the unfortunate side effect of triggering a Blazing Saddles memory. But once I got to know her, all those silly thoughts disappeared as the cleverness and fortitude she exhibited in dealing with her predicament took center stage. She’s a worthy heroine. She’s also no match for a determined matchmaking canine. Poor Rafe, the hero; he has such a thorn in his side, a chip on his shoulder, all from his treatment by the Sinclair family. It’s rightly earned, so imagine his surprise, and my delight, that the woman who makes his libido go out of control is a dreaded Sinclair. He is so determined to resist her, except, he can’t. The more time he spends with her, the more shocked he becomes, both from what he learns about her and his own reactions. Ms. Lorret truly has written a story that embraces all the most wonderful aspects of romance with Rafe and Hedley as a couple. This is the second book in the Rakes of Fallow Hall series yet this is a sold standalone read. The overall story arc is the wager between three men. I haven’t read the first book in the series and never once did I feel the lack. This is a fun and entertaining novel all on its own. There’s humor, witty and fascinating dialogue, and just the right amount of emotional drama to keep a reader engaged page after page. The seduction scenes between Rafe and Hedley are spicy enough to keep a fan nearby just in case. My absolute favorite extravagant and romantic gesture comes from Rafe, he creates something that is so beautiful and unique that the heroine can’t help but believe with all her heart that he truly loves her. It’s actually quite swoon-worthy. The villains of the piece, the external conflict, actually come from Hedley’s own family. Wow, did Ms. Lorret create some effective despicable characters! I would have turned into a harridan/banshee on Hedley’s behalf. In no way could I have resisted wanting to throttle them for the very act of speaking. Hear me growl. The Devilish Mr. Danvers should not be missed for readers who enjoy Cinderella themed stories. This one does it justice because this time, the heroine has an active champion to woo and care for her, and through him, others of power who have her back. There are plenty of occasions to cheer for Hedley and Rafe and I encourage historical romance fans to not miss out. Grab a copy and enjoy the ride. 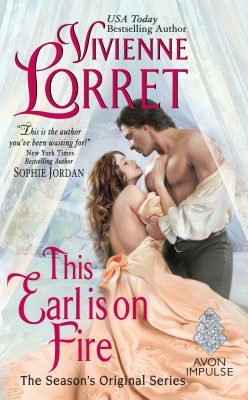 THIS EARL IS ON FIRE on sale in paperback today! It’s here!!! THIS EARL IS ON FIRE is available in paperback today! I had so much fun writing Liam and Adeline’s story. In fact, I’ve loved writing this entire series! We get to know Liam a bit more in THE DEBUTANTE IS MINE (book #1 of the Season’s Original Series), and quickly learn that he’s being manipulated by his “friend” Max, who believes he can make Liam the Season’s Original. Then, in THIS EARL IS ON FIRE (book 2 of the Season’s Original), we finally have Liam’s story (cue Etta James’ At Last…) and we also meet his unlikely heroine, the sheltered country miss, Adeline Pimm. For those of you who’ve been waiting to add the paperback to your tbr pile, I won’t give anything away. I just love research! Discovering little historical tidbits feeds my inner nerd. I can’t begin to tell you how tired my family is of hearing “Guess what I learned today?” So much eye rolling! I searched online and found nothing. I went to the library database and found nothing. Then I asked my friend and local research librarian, but she didn’t know either. She came up with the same results that I had. However, she had a secret weapon that I didn’t have—connections. She knew a food historian. This “hot and hot” became such a puzzle for all of us that, after compiling research, the food historian blogged about her findings. So cool! In the end, she found that asking for your food and drink to come “hot and hot,” meant that you wanted everything when it was ready. No waiting. In other words, bring the ale now. And if the broth is done, then bring it to me, as well, while the kitchen prepares my leg o’ mutton, aspic and eggs. Um… yum? Or, to put it in a modern context… If you make pancakes in a skillet, one by one, then instead of waiting to compile a short stack for your family, you’d serve each steaming flapjack—butter melting, syrup oozing—one at a time, and fork at the ready. All this week, we’re revisiting the Wallflower Wedding Series with Tasty Book Tours. At each stop, you’ll have a chance to enter a giveaway (with a prize pack that includes: the Wallflower Wedding books 1-3, author swag, and a canvas tote for my current series–The Season’s Original). THIS EARL IS ON FIRE Paperback Giveaway! THIS EARL IS ON FIRE (book 2 of the Season’s Original Series) will be available in paperback on September 20th! Yay! I’m giving away 2 advance reader copies!!! To enter TWICE, leave a comment AND share this post on Facebook. The 2 winners will be randomly chosen on Friday, September 9th and notified via email. *each winner will receive 1 paperback of THIS EARL IS ON FIRE, a Season’s Original Series canvas tote, and assorted swag.